Nov 15, 2018 - Thatch Fibres, Clay Bricks, Thermo Mechanical Properties, .... conductivity of kapok and coconut fibre could be used as substitute to synthetic. Mar 1, 2010 - Complex modulus test results in Black plot for all GB PMB samples and 2S2P1D simulations for each test . ...... bath at 18Â±1Â°C for 7 days with a tolerance of two hours. 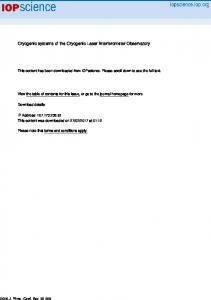 ...... Retrieved from http://trid.trb.org/view.aspx?id=636498. produce the colored side products, but requires dissolution of the sample in water, followed by .... pointed out that, unlike light radiation, the energy of sonic. doi: 10.1016/j.mspro.2015.06.076 ..... and high frequency makes the cantilever to have low mass (Eric Finot et al., 2008) or (William P. King et al., 2002). ..... Blake N. Johnson1 and Raj Mutharasan, âThe Origin of Mass-change Sensitivity within . Jun 9, 2014 - Manufacturing: Powder Characterization, Process. 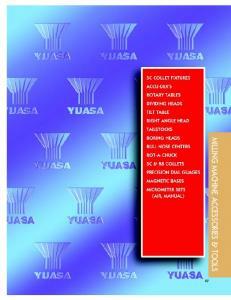 Simulation and Metrology," Proceedings of ASME Early. Career Technical Conference, Vol. Apr 6, 2013 - on Springer's website. .... tensor and the CTE of the constituents, respectively. .... the CTE owing to its lower thermal expansion coefficient. Oct 2, 2015 - Linear Temperature Distributions, Journal of Thermal Stresses, .... Employing modified couple stress theory the non-linear free vibration of FG. Cryogenic cooling is emerging nowadays as an effective method for high performance machining, improving the machining efficiency as well as the surface integrity of the machined parts. Aluminium–lithium (Al-Li) alloys will likely become the material of choice over composites as the fuselages of the aircraft due to its higher strength-to-weight ratio and excellent corrosion resistance. We study the influence of liquid nitrogen (LN2) cryogenic cooling in milling process on surface residual stress of the generated Al-Li alloy parts. The model of the intrinsic thermo-mechanical coupling characters during cryogenic milling process is developed, which determines the cutting temperatures and forces related to the process parameters. Models and experimental results indicate that the cutting forces change little, while cutting temperatures do much under the LN2 cryogenic cooling and conventional dry milling operations respectively. Then the residual stresses of part surfaces after milling under the two different conditions are measured. Measured results show that the residual compression forces(negative values) under the LN2 condition is much less than those under the dry milling operations. This states clearly that the cutting temperatures contribute much more than the cutting forces to the part surface residual stresses. .
1. Introduction Al-Li alloy plays great role in the aircraft structures because of the higher strength-to-weight ratio and the excellent corrosion resistance. In the past, some Al-Li structures are made using the chemical-corrosion method, which in results leads to the environmental problem. Nowadays, mechanical milling replaces the chemical method in making these structures, improving the machining efficiency and avoiding the possibility of environmental pollutions. However, in a milling process the structure surfaces are subjected to the strongest loads as well as to environmental influences. In addition to the mechanical and thermal stressed, environmental influences and influences of other components, subjected to the cooling conditions, should be taken into account. Ti6Al4V caused by the hardening of workpiece at lower temperature. In contrast, the lubrication effect of LN2 is verified by experiments in , which reduce the friction force. Recently, the influences of cryogenic cooling on the enhancement of surface integrity attract extensive attention. Biermann et al. 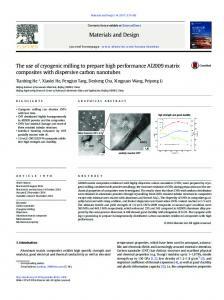 conducted cryogenic milling of aluminium alloys using Carbon-dioxide snow and found that the surface quality was improved due to the suppression of burr formation. Pušavec et al. investigated the influence of cryogenic machining on the surface integrity of Inconel718. Their experimental results show that in cryogenic machining the compressive zone was extended from 40ȝm to 70ȝm and the hardness on the surface increased from 500HV to 800HV. Pu et al. reported that cryogenic machining of AZ31B Mg alloy can get 10 times larger compressive areas in residual stress profiles and introduced significant grain refinement, which remarkably improved the corrosion/wear resistance of the machined surface. Rotella et al. investigated the effects of different cooling conditions on the surface integrity of Ti6Al4V and the result indicated that cryogenic cooling contributed to make products having better surface integrity with smaller grains in contrast to MQL machining. However, the relationships between the process parameters and the surface integrity are addressed little. Especially, the control factors directly affecting the part surface residual stress are not revealed adequately. The remainder of this paper offers the followings: - We report the experiments of great compression stress improvement under LN2 conditions. End milling tests under the dry cutting and LN2 conditions with the same process parameters are carried out and the residual stress on the Al-Li surfaces after milling operations are measured and compared. - To explain the experiment results, the machining thermalmechanical model is presented to understand the mappings from the process parameters to the cutting forces and temperatures, respectively. The model results are consistent with the measurement results of cutting forces and temperatures in milling process. The model and measurement results show that with the same process parameters the maximal cutting forces remain unchanged under the LN2 and dry cutting conditions, however the part temperatures vary greatly under the two different coolant conditions, respectively. Based on the model the relationship among the process parameters--cutting forces and temperatures--the residual stresses are revealed. 2. Experiments setup and results The cutting experiments are carried out on a milling center VMC-50. The used cutter is a four-flute end mill with center tooth supplied by SECO Company. The cutter parameters are given in Table 1. The part for cutting test is the Al-Li alloy 100mm*100mm*6mm rectangular block. To obtain the cutting forces and temperatures, the dynamometer Kistler9257B and T-style thermocouple are used, respectively. As shown in Fig. 1(c), a 1mm*88mm slot is made on the Al-Li block, then the thermocouple (coppery line) is implanted into the slot. The block with the thermocouple is clamped with another Al-Li block by screws, see Fig. 1(b). The specimen for milling tests, including the two Al-Li blocks with implanted thermocouple, is mounted on the dynamometer, which is fixed on the rotating platform of milling center, see Fig.1(c). We conduct series of cutting experiments with different process parameters, listed in Table 2. With these process parameters the cutting forces along three orthogonal directions and the cutting temperatures under the LN2 and dry conditions are measured and shown in Table 2. From Table 2, we can see that the tendency of the changes of cutting forces with the same process parameters under the LN2 and dry conditions respectively, are very small. In contrast to the small changes of cutting forces, the obvious changes of cutting temperatures can be observed, under the LN2 and dry conditions, respectively. To tell if the experimental results are general for milling of Al-Li, we will give the model explanations in the next section. After measuring the cutting forces and temperatures in milling of Al-Li, we measure the residual stresses of the part surface after milling operations with the same process parameters under the LN2 and dry conditions, respectively. In this section, an analytical mode for cutting forces is developed based on the predictive machining theory proposed by Li et al. [9, 10, 11]. The model predicts the milling forces from the input data of workpiece material properties, tool geometry and cutting conditions. This is done by discretizing the cutting edge into a number of slices along its axis direction. The cutting action of each slice is modeled as oblique cutting process with the inclination angle which is equal to the helix angle of the cutter. 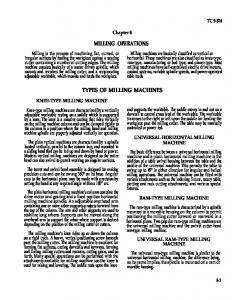 The cutting forces in oblique cutting are predicted using the predictive machining theory . The total forces in end milling are then calculated from the sum of the forces acting on at all slices. specific heat of this alloy are taken as 2500kg/m3, 168W/mK and 1203J/kgK, respectively. These known parameters including workpiece material properties, tool geometry and cutting conditions are input to the predictive oblique model  to predict cutting forces ( dFt , dFr , dFa ) for each slice. The predicted cutting forces in local coordinates for each slice are transformed in global coordinates in the following matrix form: ­ dFx ½ ª  cos I j  sin I 0 º ­ dFt ½ ° ° « ° °  cos I 0 »» ® dFr ¾ ®dFy ¾ « sin I ° dF ° « 0 0 1»¼ °¯dFa °¿ ¯ z¿ ¬ (4) The total cutting forces in the global x, y and z directions are calculated by summing the differential cutting forces for each slice ( dFx , dFy , dFz ). We give the simulation results of cutting forces under the LN2 coolant and dry conditions, shown in Figs. 6 and 7, respectively. It can be seen that the predicted results are agreement with those in Table 2.
where W s is the shear flow stress of the part material and J is the shear strain. J* J J0 is the ratio of the shear strain rate to a reference strain rate J0 (10-3s-1 is taken in this analysis). intensity qcool h (T  T0 ) , where h is the overall heat transfer coefficient, T0 is the room temperature. In terms of the above cutting temperature model, the cutting temperatures under dry and LN2 conditions are given in Figs. 8. It can be observed that the cutting temperatures obtained from the predictive model, are consistence with the experimental data shown in Table 2. 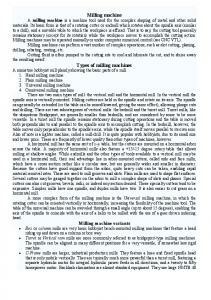 Report "Cryogenic Milling of Aluminium-lithium Alloys: Thermo-mechanical ..."